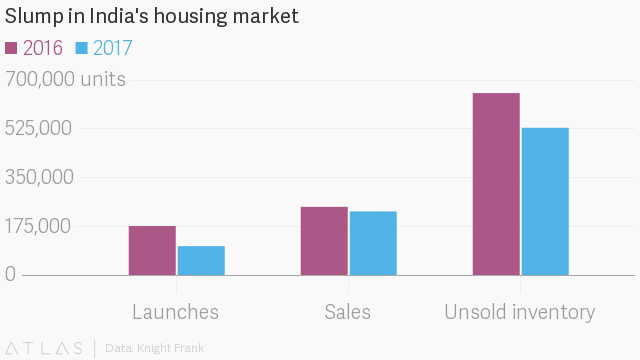 Even plummeting prices haven’t been able to entice India’s home-buyers. Home purchases in the country fell to a seven-year low in 2017 despite sliding prices, according to real estate consultancy firm Knight Frank. A new tax regime and a regulation introduced last year have pummelled a sector already reeling under the aftermath of demonetisation in late 2016. “At the end of 2017, India’s residential sector appears to have shrunk to a fraction of the size it was less than a decade ago,” said Shishir Baijal, chairman of Knight Frank. New project launches fell 41% and sales of new homes fell 7% in 2017. There are still hundreds of thousands of unsold properties, and it may take nearly two years to sell off just those, the report says. Not surprisingly, property prices tumbled in many cities. While other parts of India suffered, even Mumbai, India’s most expensive housing market, bled as property prices fell in 2017—the first time in nearly a decade. Yet, the price-to-buyer’s income ratio (the average number of annual incomes required to own a house) in Mumbai remains at a prohibitive 7.8—much higher than in other major Indian cities—even though it is off its peak of 11 in 2010. To counter the slump, developers have been offering discounts, and waiving stamp duty, and floor-rise and other charges.